THE "WILD WEST. "—The Duc d'Orleans visited the International Horticultural exhibition and Buffalo Bill's Wild West on Saturday afternoon. 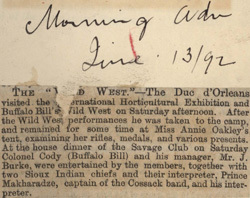 After the Wild West performances he was taken to the camp, and remained for some time at Miss Annie Oakley's tent, examining her rifles, medals, and various presents. 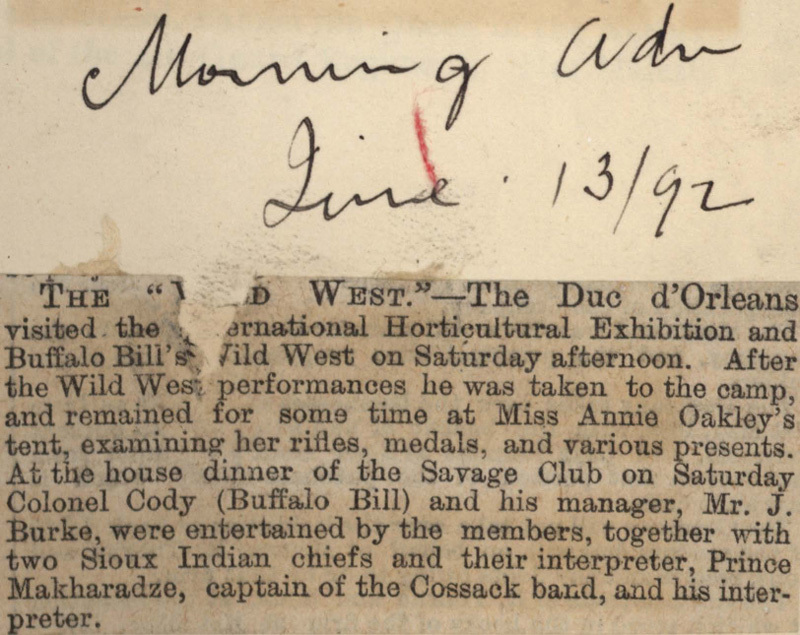 At the house dinner of the Savage Club on Saturday Colonel Cody (Buffalo Bill) and his manager, Mr. J. Burke, were entertained by the members, together with two Sioux Indian chiefs and their interpreter, Prince Makharadze, captain of the Cossack band, and his interpreter.